Move America Forward, in cooperation with the City of Rancho Cordova and the Rancho Cordova Chamber of Commerce, as well as cooperation from several important supporters and many more volunteers from the community came together to honor the 17th anniversary of the tragic events of September 11th, 2001 so that we never forget that day when our world profoundly changed. 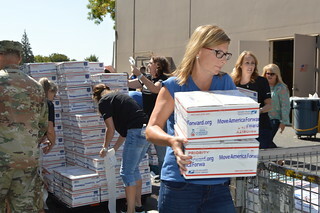 The 9/11 PACKATHON shipped 2001 care packages to the troops still fighting on the front lines in Afghanistan and Iraq in the wars that were spurred by the terrorist’s attacks on 9/11. Volunteers also packed 911 more to be shipped in the following days. 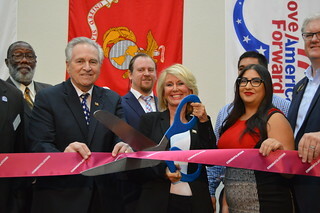 The 9/11 PACKATHON kicked-off with a short opening ceremony at the Move America Forward headquarters featuring music and speeches from several important speakers from the community, local elected officials, active duty military, and 9/11 World Trade Center Tower 2 survivor Rich Hannaford. All MC’ed by Move America Forward Chairman, Melanie Morgan. 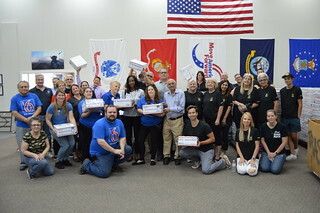 The ceremony was followed by active duty military members stationed locally and dedicated community volunteers who tirelessly packed 911 care packages and mailed 2,001 more that will be shipped to troops deployed on the front lines overseas. We were honored by our dedicated public servants in attendance including U.S. Congressman Ami Bera, California State Senators Ted Gaines, Richard Pan, Jim Nielsen, California State Assembly member Kevin McCarty sent a representative, and Rancho Cordova Mayor Linda Budge joined by Diann Rogers – President & CEO, Rancho Cordova Chamber of Commerce. 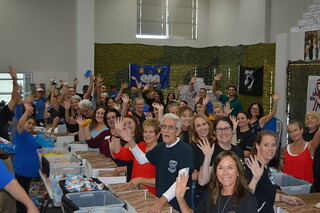 Care packages include letters of support along with high quality food and personal care items like San Francisco Bay gourmet coffee, OREO® cookies, beef jerky, Gatorade®, Planters® nuts, field towels, lip balm, deodorant, sun block, and many other useful items requested by the troops. Survivor Richard Hannaford was in World Trade Center Tower 2 on the morning of September 11, 2001 and barely escaped alive, watch as he recounts the importance of remembering those who lost their lives in this terrorist attack. THANK YOU! Answer the Call goal reached! Scott Raab from America Moving Forward shares a care package with the Cyber Tech Center and explains the purpose of MAF. Move America Forward is proud of our community outreach which extends to our military community to help them learn about our important care package program and how it can serve their new recruits as they deploy during their service. Set it and forget it! With Monthly Smiles Adopt our Troops Program, you sign up one time with a click of a button and each month a care package filled with all the goodies our troops love will be sent in your name. Just click the box that says “Yes, I Would Like to send packages all year round” after selecting your care package .